Defence Turkey: Dear Mr. AKBAŞ, first of all, thank you for your time. Meteksan Defence was established in 2006 in order to unite and coordinate the projects and activities of the high-tech companies in the defence industry, operating under Bilkent Holding, in a single framework. Can we start our conversation by touching upon Meteksan Defence’s current position, number of employees, turnover, services offered to customers, technology accumulation and vision? Burak AKBAŞ: As you mentioned, Meteksan Defence Industry Inc. was established in 2006 in order to unite and coordinate the projects and activities of the high-tech companies in the defence industry, operating under Bilkent Holding, in a single framework. The ambitious vision of the establishment of our company is to develop and design national, independent and indigenous, high-tech products and subsystems in the defence industry sector in line with the vision of the Presidency of Defence Industries, Turkish Armed Forces and other security forces. Meteksan Defence, operating in 4 main fields comprising sensor systems, communication systems, underwater acoustic systems and platform simulators, also takes part in many critical projects such as the national ship, helicopter, and unmanned aerial vehicle platform projects and the development of anti-tank and air defence missile systems. The major national and unique products developed by our company include radar systems for helicopters and UAVs, perimeter surveillance radars, altimeters, data links of tactical and strategic missile systems, sonar systems, underwater early warning and communication systems and training simulators. In the current situation, Meteksan Defence employs 270 people. More than 200 of our employees are engineering staff and more than half of them have masters or doctoral degrees. In short, I can say that we have a very competent team. In terms of turnover, we achieved a growth rate of approximately 40% in 2018 compared to 2017 and reached a turnover of over TL150 Million. 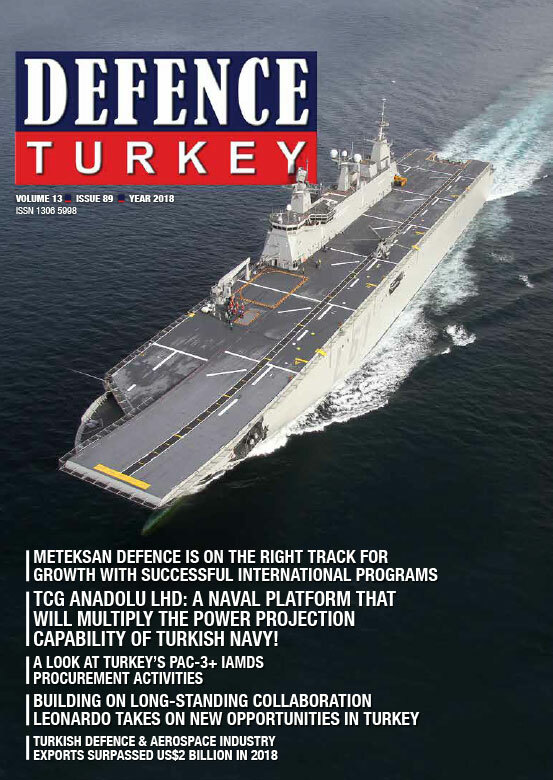 Defence Turkey: What can you say about Meteksan Defence’s 2018 foreign sales and delivery performance? Burak AKBAŞ: First of all, I would like to express that Meteksan Defence is a company that has been doing business just in the domestic market until the last few years. Especially in the last 2-3 years, we focused on the foreign market and the Damage Control Simulator became our leading product during this period. After that, products such as the Retinar PTR Perimeter Surveillance Radar and the Radar Altimeter have become products that we promote sales activities abroad. We have succeeded in signing contracts abroad with all of these products. In 2018, for the first time, we started the promotion and marketing activities abroad for the Automatic Take-off & Landing System (OKIS), the Pelikan Missile Seeker Simulator and the MİLGEM Hull Mounted Sonar. We have seamlessly delivered the Damage Control Simulator to our clients on time, and we have signed a contract with the Republic of Korea. We signed a contract with an undisclosed Asian country in 2017 for the Retinar PTR Perimeter Surveillance Radar, and we successfully delivered the radar. Again for the Retinar, we have signed a contract to provide security for an airport in the capital of a European country this year and we have delivered it in a short time within approximately 2 months, and it is still actively being used at this airport. Finally, we have signed a new overseas contract for the Damage Control Simulator in June this year. We are planning to complete the project, which will take about 2 years, in 2020. We also signed a contract on exporting avionics systems, developed for aerial platforms, with a Far East country last year and we completed the delivery of these systems successfully this year. Defence Turkey: Meteksan Defence started its first studies in Millimeter Wave Radar Technology during a time when it wasn’t a field that Turkey invested in yet and developed MİLDAR, the first fire control radar in Turkey operating in millimeter wavelength with Target Detection-Tracking and Terrain Profiling features. What can you tell us about the current status of the Helicopter-MİLDAR Project, which was officially accepted by the Presidency of Defence Industries Acceptance Committee on June 23, 2017? After the Helicopter-MİLDAR fire control radar became operational on national platforms, what are the expectations for this product in foreign markets? Have you set target markets in this regard? Burak AKBAŞ: The critical point for the export of the Helicopter-MİLDAR is the utilization of this radar on our national platforms. We all agree that it is not an easy task to sell this type of sub-system when it is not included in the final configuration of the helicopter and not actively used at theater by its own country. For this reason, our first priority is to utilize the Helicopter-MİLDAR on the ATAK helicopter in Turkey. Subsequently, as ATAK helicopter exports are accomplished, we expect that MİLDAR will be exported with the platform as well. As you know, MİLDAR is a new technology radar system that is both lighter and more technologically advanced than its competitors abroad. Because of this, we plan to conduct a prospective study for using MİLDAR on various helicopter platforms in the international market for the coming years, as I have said, the first requirement for MİLDAR to become an exportable product is to use it on the ATAK helicopter. Defence Turkey: The Millimeter Wave Radar Development Project for Helicopter Platforms also included the development of the Automatic Take-Off and Landing System (OKİS), in addition to Helicopter-MİLDAR. OKIS was successfully tested on both ANKA and BAYRAKTAR TB2 UAV. Do you have any studies on exporting the system abroad? Burak AKBAŞ: The OKİS project was initiated to develop a system, which was previously imported from abroad, with national resources and eliminate the foreign dependency on this issue. As the GPS signal is unprotected against spoofing, OKİS emerges as a safe solution for the automatic take-off and landing of UAVs. The low volume and weight of the aerial terminal and the antenna, low power consumption and ease of integration greatly expand the range of UAVs addressed by OKİS. We had the chance to test OKİS by integrating it into BAYRAKTAR TB2 and ANKA. We have achieved very successful results. When we look at the larger sized UAVs such as ANKA, OKİS-like systems are used. Additionally, the successful utilization of OKİS in BAYRAKTAR TB2, which is included in the tactical UAV class in size, demonstrates the outstanding features of our design. When you look at the world, the number of OKİS-like systems are thin on the ground. In addition, as GPS systems have disadvantages such as spoofing and jamming, the global interest in OKİS-like systems increases. For these reasons, we can easily say that there is a serious market opportunity for OKİS, but in order to eliminate the question marks that may occur when approaching a customer, we need to make sure that OKİS is added to the inventory for domestically developed UAVs. Subsequently, I’m sure that OKİS will have significant export potential and will be an important alternative for international UAV manufacturers. Defence Turkey: You’ve developed the Retinar perimeter surveillance radar product family with your own resources and with your know-how and experience in Radar Systems. Retinar PTR achieved its first export success in August of 2017 and had its second export success in July 2018 when it was selected by a European country as an airport perimeter security system. Retinar PTR perimeter surveillance radar was also entered the Turkish Land Forces Command and Gendarmerie General Command’s inventories in 2018. Can you share some information about the interest shown in the international market for the Retinar Radar, a product which provides effective solutions for the security of borders, areas, bases and critical facilities? Burak AKBAŞ: Retinar PTR was developed for security operations such as perimeter surveillance, perimeter security, camp protection and border & coastal surveillance. We have made a good start by signing 2 foreign contracts for our Retinar product family consisting of Asian and European countries. International sales activities by nature, require long-term and serious financing. In particular, the budget and human resources activities allocated for companies in Meteksan Defence’s scale are limited. Also in the case of Retinar, we are competing with giant US and European companies which are very well-known in the market. The fact that Retinar PTR has entered the Turkish Land Forces Command inventory will also strengthen our hand in the international market in the upcoming period. In the current situation, there are some countries that we are in contact with that have serious opportunities. All users, who are looking for high-tech radar solutions for the security of critical facilities such as airports, power plants, military bases and border security, are interested in Retinar. I hope that I can give more concrete information about them in 2019. On the other hand, as you know we have the KAPAN Anti Drone System which Retinar OPUS utilized as the main sensor and we developed this in cooperation with expert Turkish defence industry companies, specialized in their fields. When you look at the world, drones are becoming increasingly serious threats. In order to prevent attacks of terrorist organizations with explosives-laden drones, drones should be identified and destroyed at appropriate distances. At this point, we are continuing our efforts for KAPAN Anti Drone System at full speed. In 2019, we would like to have an operational system that has proven itself in the field. I believe the KAPAN Anti Drone System will be one of the most important export products of Meteksan Defence in the coming years. Defence Turkey: In the field of underwater acoustics technology, you have been selected as Turkey’s “Center of Excellence in Underwater Acoustics” at the end of the process which began with the industrialization of the hull-mounted sonar systems of the ADA Class Corvettes under the MİLGEM Project. In this framework, with the contract signed in May 2009, you undertook the industrialization of sonar wet-ends, and as of 2016, you were also entrusted with the production of sonar wet-ends of the 3rd and 4th ships of the MİLGEM (TCG Burgazada ve TCG Kınalıada) along with the industrialization of sonar dry-ends of the vessels. The YAKAMOS-1 sonar used in the TCG Burgazada Corvette was delivered in March 2017 and the YAKAMOS-1 sonar used in the TCG Kınalıada Corvette was delivered in January 2018. What can you tell us about Meteksan Defence’s infrastructure and knowledge that has been obtained in the field of sonar systems in the last 10 years? Where do you see the company according to the world market? Burak AKBAŞ: When you analyze the sector reports, the world sonar market is estimated to be around US$ 4 billion. This figure represents all civil, scientific and military sales. The sonar market of Turkey is estimated to be around the level of 1-2% of the world market. When you look at from this perspective, it becomes clear why it is not a coincidence that every country has only one sonar company. Moreover, in order to become a world-class competitive sonar company,the annual turnover must exceed US$ 200 million. In order to reach this figure, the ratio of annual exports to total turnover should increase to 60-70%. The MİLGEM Hull Mounted Sonar - YAKAMOS, which emerged with the industrialization steps at the right time, has the potential to be a significant export product of our defence industry. The MİLGEM Sonar served in the Atlantic Ocean, the Pacific Ocean and the Indian Ocean with our TCG-Heybeliada and TCG-Büyükada corvettes apart from their own territorial waters. The sonar was utilized in all these missions and exercises and its performance was proven. The MİLGEM Sonar, industrialized by Meteksan Defence, was designed as a product with provided solutions to outdated units, increased localization rate with domestically designed components, hardware-independent software, easier to use UI (User interface) and an updated document set that includes all these innovations. The results of all these developments were witnessed in the sea trials of the TCG-Burgazada in the short term. Beyond the targeted performance criteria, we have achieved test results with significant performance improvements compared to their counterparts. Of course, technology does not stay the same. We have already set up our roadmap to carry the MİLGEM Sonar YAKAMOS into the future. We’ve analyzed the technology trends and customer expectations; examined the competitive conditions of the future. We tried to match our projected developments with the platform modernizations and production projects in Turkey on a calendar basis. Our aim is to continuously improve and increase the performance of the MİLGEM Sonar YAKAMOS within the product lifecycle and to add features that will make a difference in international competition without ignoring compatibility concerns. At first, YAKAMOS will be included in the export activities of MİLGEM. We aim include our sonar family in platforms other than MILGEM in export markets in the medium to long-term. At this point, I would like to announce that the Pakistani Navy has chosen the MİLGEM Sonar for their Corvettes along with the export of MİLGEM. The main factors affecting this decision were the performance of the Sonar as a whole with the platform on which the sonar was integrated and also customer satisfaction of the Turkish Navy. Ease of maintenance and low failure rates with the use of the MILGEM Sonar will be one of the most important customer satisfaction elements for both the Turkish and Pakistani Navy. Defence Turkey: You have started to develop and produce the data links for the national missile systems in Turkey. In this context, you have designed and produced the data links in the Roketsan produced UMTAS-IIR, OMTAS ve HİSAR missiles. In this way, these missiles attained jam-resistant RF Data Link capability for target data updates (to receive information about the target such as current location, speed, and distance) during flight. The Factory Acceptance Tests (FAT) of the KEMENT Project, signed at the end of 2013 with the SSB, were conducted with the participation of the TurAF and SSB representatives in August of 2018. An announcement was made for the first time that you have completed the C-Band Data Link for UAVs in 2018 as a result of the experience gained from these projects. Are there any export opportunities on the horizon for the Data Link? Burak AKBAŞ: Missile data links by definition are designed as missile oriented products. You need the detailed structure and parameters of the missile to design and manufacture them. For this reason, we can say that it is not possible to export data links to a foreign missile manufacturer. The tactical data link terminals developed under the KEMENT project and operating in the network structure, are planned to be used primarily in cruise missiles and related air platforms. After the completion of the project, KEMENT tactical data link terminals will have an architecture that can be used in various applications and platforms in which long-range, electronic warfare protected, high-speed tactical data communication is required. I believe, in the processes after the completion of the KEMENT project, by developing an export version of the tactical data link terminal that we have developed, we will achieve significant export potential in friendly and allied countries that cannot access similar terminals. As Meteksan Defence, we have completed the development activities of the C-Band Data Link System, which provides point-to-point communication at 200 km range between the ground systems and unmanned aerial vehicles operating at high, medium and low altitudes. We will unveil this product at IDEF19, and then we will start overseas promotion activities following our market research and strategic planning. Defence Turkey: Meteksan Defence has the most contemporary and modern solution in its field with the Damage Control Simulator developed for the requirements of the Navies throughout the world. Negotiations have occured for the delivery of the Damage Control Simulator with an unnamed Gulf country. Have you reached an agreement with the country in question? Compared to the systems currently in use, what additional features will be included in the Simulator that is to be delivered? Burak AKBAŞ: The Damage Control Simulator contract was signed with the aferosaid country. As we do not have permission to make a statement yet, I am unable to provide detailed information, but we have signed our third export contract for the Damage Control Simulator including this country. Basically, it has similar features and infrastructure with the simulator used by the Turkish Naval Forces Command, but of course, we make some changes in the interior design considering the ships that are in the inventory of different countries. We will complete the deliveries in this project in 2020. 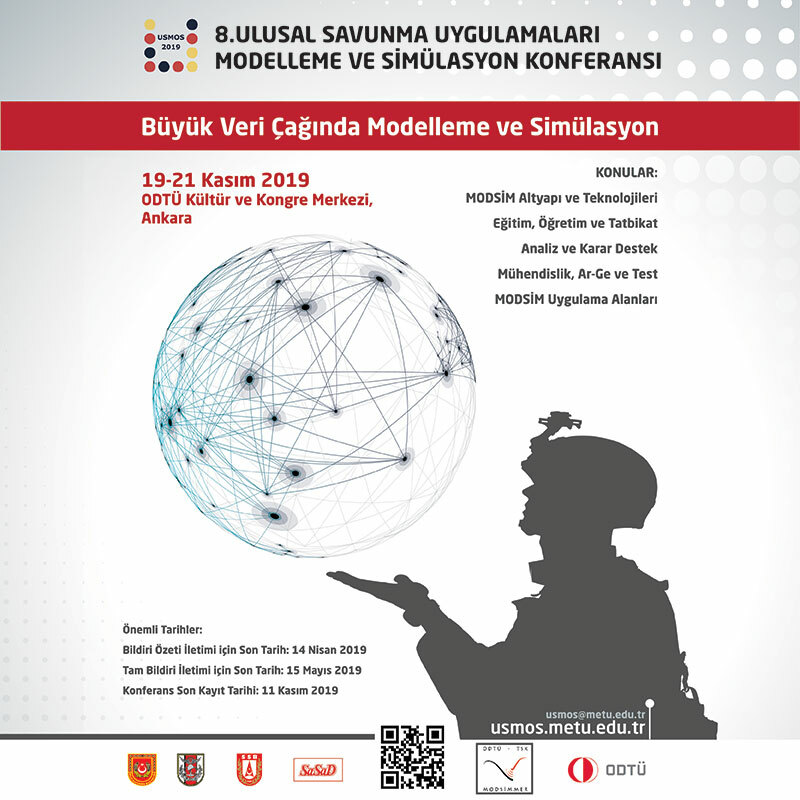 Defence Turkey: Have you started to deliveries to the Republic of Korea for the Navy Damage Control Simulator Project which you cooperated with Inno Simulation? As of June 2018, facility construction and installation activities were still ongoing under the Project and the delivery of simulators was expected to be completed in 2018. 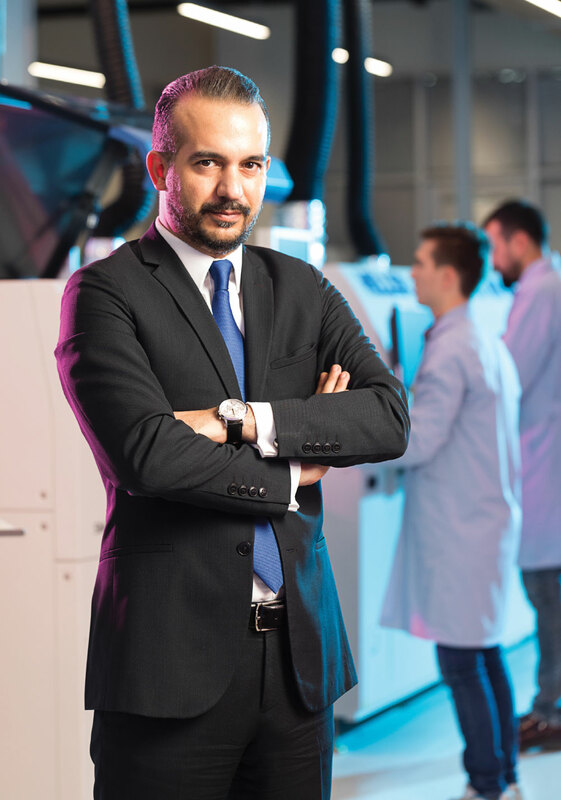 Burak AKBAŞ: We have completed our deliveries for the Republic of Korea Navy Damage Control Simulator Project, which we cooperated with Inno Simulation, and the acceptance activities have been completed. Defence Turkey: The Pelikan RF Missile Seeker Simulator was contracted in December 2011 and developed with national resources. It entered into the service of the Turkish Navy in June 2017. Is there any interest for the PELİKAN Simulator on the international market, and do you expect any orders in the near term? Burak AKBAŞ: As you mentioned, The PELİKAN Missile Seeker Simulator entered the inventory in 2017. We made some initiatives in 2018 for a limited number of countries, yet we are at the very beginning of the process, but the system is welcomed with great interest in every country that we speak with. We would like to sign a successful export contract thanks to the PELIKAN simulator in the coming years. Defence Turkey: Finally, is there a message you want to send to our readers?